Lance decides to stay at the club with Jay Jay. Bill, Amy and Anne arrive home early because the club was lame. Amy is worried because Lance hasn't arrived home yet. Lance is doing some really lame country and western dancing on his own. Jay Jay comes along and he tells her that he met a girl in the dancing line, and they're off to another club. Bill and Anne are trying to smooch on the couch, but Amy keeps interrupting, worrying about Lance. Bill gives up and decides to go home. Amy settles on the couch and Anne goes to bed. Peter and Sarah are working on invitations to his bucks night. Joel says that Phil would be up for a bucks night. 'He may look like a mild mannered accountant, but I'm sure deep down he just wants to jump around with his undies on his head like the rest of us' Toadie comes out of the bedroom and asks Sarah for some h00air wax. Joel tells him to make the most of it, because tomorrow ‘those silken locks will be history'. Toadie laughs and says they still have to raise $300 so his hair is safe. Joel says he shouldn't be so confident. Peter agrees plenty of people want to see him get his hair cut. 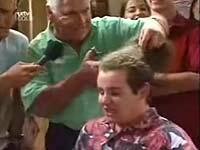 Toadie says his hair is his calling card. They work through a list of male residents to invite. When they get to Karl, Peter says he's a good bloke, and he'd like to invite him. There's a brief pause, before Toadie covers saying he can invite who he likes, and Sarah decides to take herself off to bed. Bill asks Karl for a lift, Karl says he thought Bill was too independent for that. Karl opens the driver door and tells Bill to get in. He gets in the driver side, and climbs over to the passenger side, despite Karl's protests. We see Amy watching out of the window as Lance walks down the street, returning from his night out with his shirt undone halfway up. He waves Karl and Bill off in the car, then talks to Joel, who's getting his paper, about what a great night he had. Joel makes a crack about his dress sense, but he's too happy to care. Peter gets up to leave to try on his tux, despite Sarah's tempting him with her muffins. He kisses her as he goes. Toadie jokes about not worrying about his kiss, and Peter says he'll get one when he gets his hair cut. Sarah sits next to Toadie, who notices she's distracted. He asks if there's anything going on she wants to tell him about. Amy rushes over to the couch to try and pretend that she's still sleeping. Lance comes in, throws his jacket over her and practices some line dancing moves. Anne comes out and asks him if he's had any sleep. He says he's had 3 hours sleep in the last 2 days, but he has had the greatest night of his life. Turning his head in Amy's direction and raising his voice deliberately he says it involved a girl ‘Called Me-gan'. They walk into the kitchen and he carries on telling Anne all about Me-gan, and how he thinks he's in love. Amy gets up and Lance pretends he had no idea she was there. She asks him about Me-gan, but he just walks off to have a shower. Amy looks hurt. Anne pretends not to notice. Sarah denies there's anything wrong with her, saying it's just wedding jitters. Toadie asks if it's Karl, which again, she denies. She says she's been thinking about what happens if Peter has to go off on ‘another doctor thing', leaving her on her own. She says she'll sort it out after the wedding. Toadie says she's in denial. Sarah says he should stop talking to her like a lawyer, marrying Peter is the right thing to do and the best thing that's happened to her in ages. Lance is on the phone to a friend about the hot girl he's met ‘better than Xena, better than Baby Spice'. Amy comes in to take a magazine off the table, and looks hurt. She goes into the kitchen where Anne asks if she wants to go down to the radio station to check out Toadie's hair pledge. She thinks he'll back out of it. Amy doesn't pay much attention and starts listening Lance's phone conversation. Anne starts to listen with her, but she doesn't really approve and drags Amy away. Joel meets Bill and Karl in the bar. Bill's brought a camera to watch Toadie's hair event. They ask Lou if he wants to go, but he can't get the cover. Joel and Bill leave, taking a picture of Peter entering as they go. Peter approaches Karl to invite him ‘personally' to the bucks night. Karl tries to get out of it, but Peter tells him a story about a bucks night and what a great time they had. Karl promises to think about it, and offers to buy Peter a drink. Sarah comes in and just sees the two of them laughing together. Toadie is telling his listeners that they're still $300 short of the $1000 needed before he'll cut his hair off, so he's feeling confident. Joel and Billy come in and point and laugh at him through the window. Lou is passing a bucket round in the pub encouraging people to put 50c in. 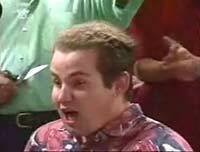 He phones the radio station telling Toadie they raised $50 in 5 minutes. He raises another $20 on the phone. Joel and Bill laugh at him through the window. They haven't got much money but try to rustle some up through the Uni. Amy is plugging Lance for more information about Me-gan. He says Amy would like her because she's ‘really funny and a knockout, a dancer' Amy gets her first name out of him, but he can't remember her last name. This leads Amy to think he's just making her up. He says he isn't and she challenges him to prove it, as Anne comes in. He says her phone number is in his flares, and goes to get them. Anne tells him she put his flares in the wash and dried them. He pulls them off the side, and goes through the pockets, but he can't find anything, not even a washed piece of paper. Anne and Amy arrive just in time to hear Toadie countdown to the end of the fundraiser. Just as he's counting, the door of the studio opens and Lou slaps the final $200 on the table. At which – he cuts off the Toad's ponytail! The audience cheers, as he holds it up, and Billy takes a picture. Bill gets bored doing his accounts and takes a break. He goes over to Anne to find out what she's writing. She's been writing in her journal about Toadie's hair being cut off. He asks to have a read, but she refuses. He pressures her a little bit in a jokey way and with a kiss. She pretends to read a bit about her boyfriend wanting to look in her diary, and how if she keeps it up, she might have to drop him. He takes the hint, but tells her if she changes her mind, she knows where to find him. Lou hangs Toadie's old pony tail behind the bar. He says he'll get a plaque and call it ‘The Metamorphosis of The Toad'. Amy says she thinks it's sick leaving it up there. When Karl comes in he says it's a hygiene risk. Toadie comes in with a new short hairdo, dyed several different colours. As Karl says, he looks like a kaleidoscope. 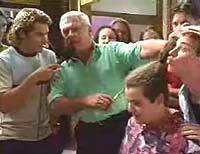 KARL: Underneath that ridiculous colour, that's not a bad haircut, we'll make a lawyer out of you yet. Sarah is obviously upset. Toadie walks in and asks what's wrong, but she says it's nothing. She notices his hair and he says it's just temporary (meaning the colours) because he lost a bet, and asks her what she thinks. She likes the cut, but not the colours. She asks if he minded losing the bet, but he says he was on the verge of getting it cut anyway. He asks her several times what's wrong, but she won't tell him. He gets her to sit next to him and puts his arm around her. He guesses it's about Karl and tells her that Karl loves Susan not her, and she shouldn't let it ruin her life. She starts crying and asks how can she marry Peter when she's still in love with Karl and asks Toadie to tell her what to do.